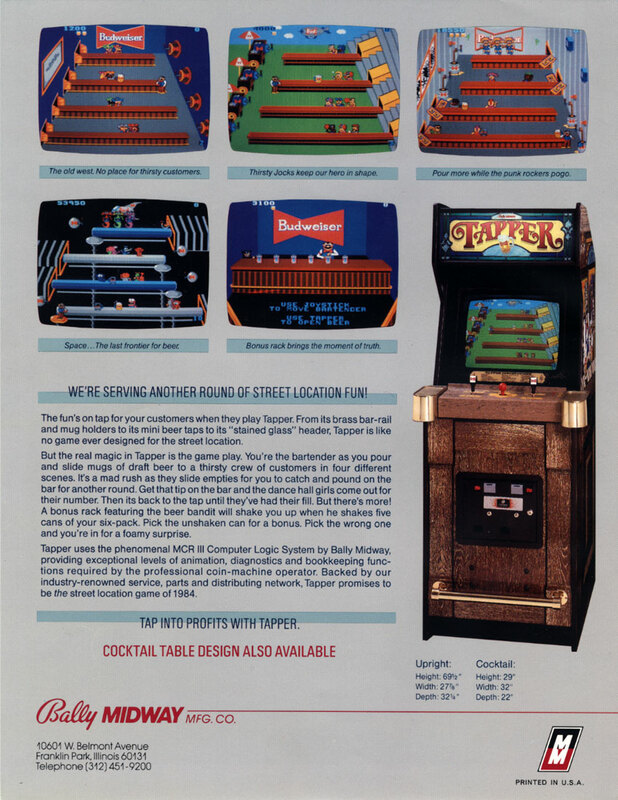 Краткое описание: The Tapper game screen features four bars. Patrons arrive periodically at the end of the bar opposite the player and demand drinks. The player must draw and serve drinks to the patrons as they slowly advance towards the player. If any customers reach the player's end of the bar, they impatiently grab the player-as-bartender and toss him out the far end of the bar, costing the player a life. Periodically, customers will leave tips on the bar for the player. These tips can be left at any place on the bar. The tip will appear after a specific number of empty mugs are released by the customers, and will appear wherever the customer who releases the required mug is standing. For example, in all levels, the first tip is left by the customer who returns the second empty mug, and will be left beside wherever this customer is standing. By collecting the tip, the player earns extra points and initiates "entertainment" for that level (dancing girls on the wild-west level, cheerleaders on the sports level, etc.). While the entertainment is active, some fraction of the customers will be distracted and stop advancing towards the player, but they will also stop catching mugs. To complete a level the player must clear the entire bar of customers. 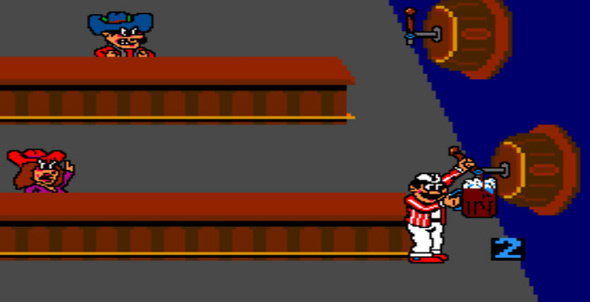 Once this is done, the player is presented with a short vignette in which the bartender draws a drink for himself, drinks it, then tosses the empty mug into the air with varying (usually humorous) results, such as kicking it and shattering it or having the mug fall atop his head and cover it. As the game progresses, the customers appear more frequently, move faster along the bar, and are pushed back shorter distances when they catch their drinks. In addition, the maximum number of customers per bar gradually increases until every bar can have up to four customers at a time. In between levels of different settings, the player is presented with a shell game-type round. In this segue, the player is presented with a single bar that has six cans of beer or root beer sitting on top of it. A masked villain shakes every can except one and then pounds on the bar, causing the cans to shuffle their positions. If any other shaken can is picked, it explodes in the bartender/soda jerk's face, after which the right can is revealed. If the player selects the unshaken can, the hero is shown smiling and a message reads "This Bud's For You" (on the Budweiser version) or "This one's for you" (on Root Beer Tapper), and the player is rewarded with extra points. After completing all the levels, 13 in all, the player starts at the first again, harder than the first time through, and with some minor variations. 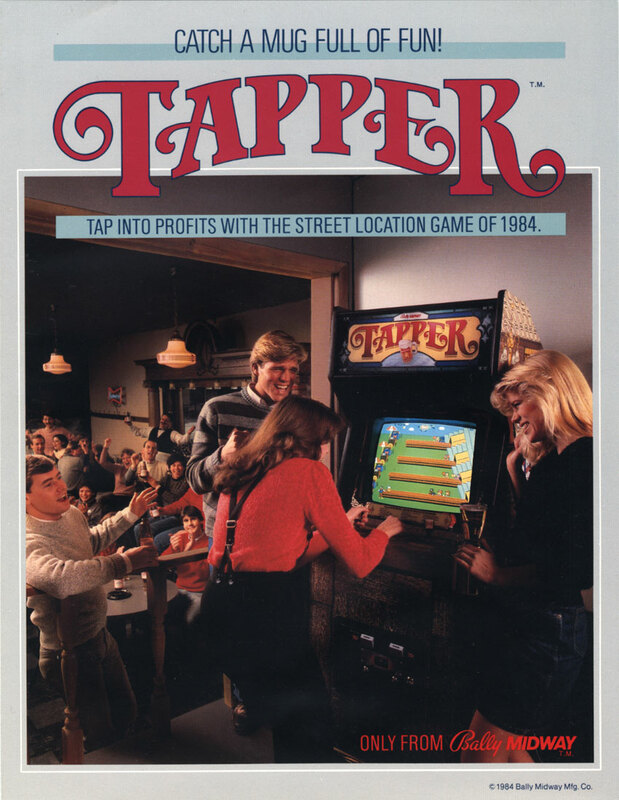 The Tapper game screen features four bars. Patrons arrive periodically at the end of the bar opposite the player and demand drinks. The player must draw and serve drinks to the patrons as they slowly advance towards the player. If any customers reach the player's end of the bar, they impatiently grab the player-as-bartender and toss him out the far end of the bar, costing the player a life. After completing all the levels, 13 in all, the player starts at the first again, harder than the first time through, and with some minor variations.